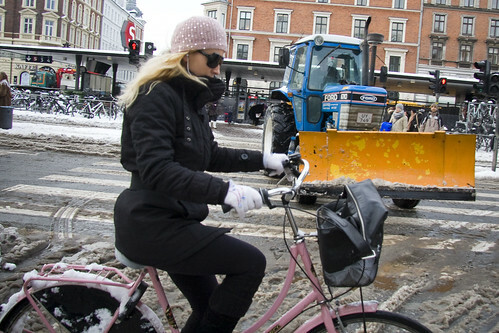 The big ol' diggers and bulldozers removing snow around the city don't seem to bother the chic cyclists. elegance, despite the elements. brilliant. We got 12" (30cm) of snow in Dallas, Texas yesterday. An all time record for us. Nobody is even driving cars much less riding bikes. We bow to the Danes fortitude. Let's talk in July.